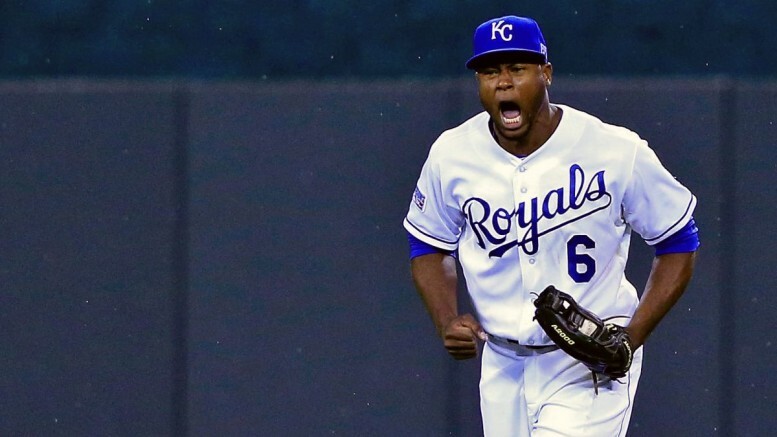 Lorenzo Cain and the Royals are World Series champions, proving parity in baseball has far surpassed football. It is easy for me to say I am going to stop watching football altogether. It is much harder to actually do it. That’s because when something feels like a part of you, it isn’t easy to give it up cold turkey. My adolescence and college years were heavily intertwined with the NFL, so to stop watching the way you could theoretically stop eating chocolate with willpower is a major challenge. But let’s face it — the NFL is having its worst year ever, while baseball is proving that every dog can still have its day. Ponder this remarkable, in-depth, fascinating truth — are you ready for this pile of information? — the Kansas City Royals are world champions. The doormats of Major League Baseball just had their title parade less than two months ago. At that same point in time, while baseball was churning out fascinating new episodes on a seemingly nightly basis, the NFL was stuck in painfully unfunny reruns. You know, like the terrible early episodes of your favorite shows where you scratch your head and wonder how it turned out so well in the long run? Heading into the final game of the World Series, the NFL still had five undefeated teams, most all of whom have been mainstays in the playoff landscape of the league for years. First of all, let me clear up what “NFDL” stands for. It signifies the “National Fake Drama League,” because it has gotten to the point where you truly have to wonder if some of these “epic comebacks” and “frantic finishes” are actually staged by the league’s ringleader, Vince McMahon… er, Roger Goodell. Sure, baseball thrives on drama, be it ninth-inning comebacks or walk-off home runs, and the Royals were no stranger to it. But most of the drama comes from the daily soap opera nature of the league rather than every individual game. The NFL can make no such claim. Nor can it actually sell hope to nearly half the fanbases in the league anymore. The Royals winning it all is an amazing turn of events for a league that was heisted by the Evil Empire, aka the New York Yankees, for over a decade between the mid-90’s and 2000’s. Remember how pathetic the Houston Astros were, like, a year ago? In 2015, they were one eighth-inning meltdown away from a trip to the American League Championship Series. In fact, the American League’s three divisions all featured new champions in 2015, and the National League Championship Series had two teams with zero combined playoff berths since 2008. That’s competitive balance. Oh, but the NF(D)L has “Any Given Sunday,” you say? Well, consider this past week’s slate of games: we had only one game out of 16 feature two teams with winning records. Some of these mismatches felt like college games, where the only suspense was whether the favorite would cover the spread. But on a broader scale, it is getting downright ludicrous, particularly the AFC. Same old, same old? I’ll say. Since 2001 (that’s 14+ years, if you’re as shocked as I am that it’s already 2015), the Super Bowl has featured just six different teams, and five different quarterbacks. The New England Patriots have appeared six times, while the Pittsburgh Steelers and Indianapolis/Denver Peyton Mannings have gone three times each. Only brief interruptions by the Oakland Raiders (2002) and Baltimore Ravens (2012) have given the big game a breath of fresh air. So maybe, just maybe, in 2015 we are due for some change? After all, the NF(D)L loves to sell parity because, frankly, it just loves to sell. So let’s take a look at the scope of the AFC, shall we? The Patriots have secured a first-round bye for the second straight year. The Steelers, again, look like vice presidents, even if they are disguised in the playoffs as a wild card entrant. The rest? The Broncos, with or without Manning. The Cincinnati Bengals, probably without Andy Dalton and definitely without a single playoff win since 1990. The Kansas City Chiefs (winless in the postseason since 1993), New York Jets, and Houston Texans round out what could be the weakest group of potential “saviors” we’ve seen in ages. Sure, the Carolina Panthers chasing a perfect season and Arizona Cardinals also being a legitimate Super Bowl contender are nice stories. After all, neither franchise has won a Lombardi trophy, coming up painfully short in their only respective appearances on football’s biggest stage. But it’s almost nauseating watching some of these supposedly heart-stopping endings. The low point was the first game played in December, when the Detroit Lions led the Green Bay Packers at home, 20-0, threatening for a season sweep. But with the “whole world watching,” could the ratings afford to take a hit with another dud? Of course not. Enter the annual fall guys and their typical collapse, as the Lions let the Packers rally to within 23-21. Incomprehensibly, Green Bay not only got the ball back in the final seconds, but after a series of laterals, a face mask was called when Aaron Rodgers’ shoulder pads were grabbed forcefully, giving the star QB one more play to run around, heave the ball downfield, and complete a Hail Mary pass because no Detroit defender realized that in order to cover a receiver, you generally have to be standing in front of him. Packers win, 27-23, and are on their way to a fifth straight NFC North title and seventh straight playoff appearance. Nothing original there. How about Carolina? Okay, they’re 14-0. They aren’t really a fluke, either. So why, then, did they decide that they didn’t want to play football anymore after pouncing on the New York Giants, 35-7, last Sunday? Instead, they decided Fox viewers needed some excitement, so they eased up as Big Blue scored 28 unanswered points. Then, the Panthers decided they finally wanted to win, so they went right down the field after doing nothing for nearly the entire second half and kicked a field goal. Panthers win, 38-35, and clinch a bye. Hours later, the Steelers trailed the Broncos late in the second quarter, 27-10. Then, they realized the Broncos had lost interest, and rallied for 24 unanswered points to win, 34-27. This is an area where football and baseball greatly differ in terms of the fabric of the sports themselves. Baseball is great for a plethora of reasons, but two in particular stand out: there is no clock, and there are no penalties. No one can sit there and shout at the TV, “Flag, flag!” or “Foul, foul!” Complain all you want about baseball being too slow, but the truth is, it takes appreciation of the mental aspect of the game and a little more patience than the average football fan possesses. Perhaps it’s human nature, but in football, teams choke and play not to lose more than in any other sport. Sure, a pitcher can tense up and lose the strike zone, or a hitter can fail in a big moment in baseball. But what is helping the NF(D)L keep its (over)dramatic essence is the fact that teams simply let up and play scared once they have the lead, especially if they are playing a team with an aura of invincibility like the Patriots, Seahawks, or Steelers. No one ever said beating any team was easy, let alone a good team, but there is never an excuse for choking. Ultimately, some of these epic choke jobs that we’ve witnessed — say, a team throwing an interception at the 1-yard line with the Super Bowl on the line — overshadow what gets remembered historically as a great feat by the team that was the benefactor of said choking. At season’s end, maybe it will all be okay. Maybe Cam Newton and his Panthers will do what the Patriots couldn’t, polish off a 19-0 season with a Super Bowl win, or maybe Arizona or another Cinderella will rise to glory. Even if that happens, the end won’t justify the means of what has been a ridiculously predictable and stale NFL season. Gleefully, the same cannot be said for baseball, as the MLB crowned the small-market Royals champions for the first time in 30 years following a half-decade span in which the unheralded San Francisco Giants won three titles. Let’s remember that baseball greatness truly takes a team effort, and that one player, namely a quarterback or his behemoth, lug-head tight end, makes or breaks a team in the NFL. Be the first to comment on "Stock report: Baseball Up Royally, NF(D)L Having Worst Year Yet"